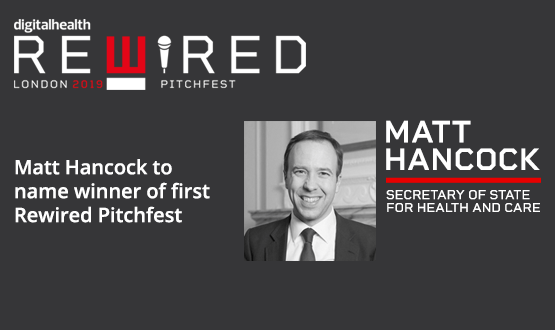 The Secretary of State for Health and Social Care, Matt Hancock, will reveal the winner of the first Rewired Pitchfest live on stage at the Digital Health Rewired conference and exhibition on 26 March. Demonstrating his commitment to digital health start-ups, the minister has juggled his busy Brexit diary to come help celebrate the rich variety of creativity and innovation that will be on display. The Rewired Pitchfest will see start-ups from across the vibrant digital health sector delivering three-minute pitches to a panel of leading investors and company founders live on the Innovation Stage. During the course of the morning the expert judges will pick a winner from each of the four quick-fire heats, after grilling the start-ups on their presentations. Following his Rewired keynote on the main stage at London Olympia, Hancock will then join the Pitchfest judges to watch the four finalists return to stage to compete to be chosen as overall winner. The Secretary of State will then announce the winner and present them with the coveted Pitchfest trophy. The MC for the morning will be Sarah Bruce, formerly marketing director at HIMSS and co-founder of Silver Buck, the sponsors of the Rewired Pitchfest. Entries are open to all start-ups working in digital health, from the UK and beyond. The judges will then shortlist the 16 lucky start-ups who will present at Rewired. A briefing webinar for everyone interested in entering the Pitchfest or how to get the most out of it, is being held this Friday (8 February). Jon Hoeksma, Sarah Bruce and judges Dr Jonathan Bloor and Dr Mohammed Mohammad Al-Ubaydli will describe how the Pitchfest will run, offer advice and answer any questions. The deadline for Pitchfest applications is midnight on 22 February. You can apply here. Successful applicants will be notified by Monday 3 March.